Names are inscribed on plaques around the base of the Memorial. The stone slabs surrounding the memorial also carry the names of the fallen. The War Memorial at the Higher Cemetery has some unusual features. Although it might seem, from the photo above, that the men named are buried around the memorial, this is not so. This large cemetery is zoned into specific areas for defined groups such as Church of England, Dissenters, Catholics and so on, therefore bodies are rarely buried in a single large plot. The plaques seen at the base of the Memorial contain the names of many men who, at first sight, seem to have no connection with Exeter. 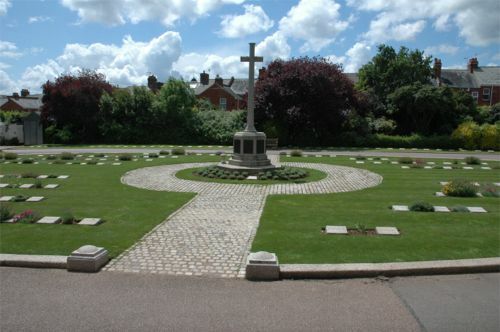 The criteria for commemoration here seems to have specified those who were householders, men who had lived with the householder for at least 3 months previous to the date of enlistment and sons of householders who, though they were not living in their parent's house, regarded it as their home. In some cases, men who had been born in Exeter and joined overseas contingents were also be added. At one stroke, this directive, issued by the Town Council, eliminated women so there is no sign, for instance, of Helen Court who was fatally injured on active duty while serving in the Women's Royal Naval Service in 1918. It also left unanswered the question of what to do about the dozens of men from Great Britain and the Commonwealth who died while being treated in one of Exeter's five Military Hospitals. A number of their wives rented accommodation in Exeter and stayed on as residents of the City to be near their husbands while they lived. Local feeling was that it was impossible to ignore the sacrifice of these men for any localised consideration so many of their names were added to the Memorial. Even so, not all the eligible names were included on the name plaques and again, there were reasons. The War Office began to compile its "Soldiers Died" list of casualties in 1919 but many men lived on well past this date, either at home or in military hospitals, yet eventually died as undisputed casualties of the war. Others died long before there was any discussion about commemorative war memorials and it was left to their families to make the appropriate burial arrangements in the various sections of the cemetery. We have included the names of those buried in Exeter's Higher Cemetery but who are not commemorated on the memorial in a separate listing (see below).